PROFESSIONAL COACH – for the rest of your life! and PRESCRIBE THE EXERCISES YOU NEED. 15 YEARS OF RESEARCH AND TRIALS distilled into a program you can actually use! be the best squatter in history! Brian is so sure you will love 10/20/Life, he offers an UNCONDITIONAL MONEY BACK GUARANTEE! “A fighter has to be strong enough to control the opponent, deliver powerful punches and kicks and deal with severe impacts. After training for more than 10 years at the top of the pro-fighting and BJJ circuit, Brian Carroll’s 10/20/Life method has not only addressed all of the above, but it has actually helped make my training fun again. Today I feel like I am training increasingly smarter as well as being much more mindful of technique—a winning combination for getting stronger and staying injury free." "Brian Carroll has earned his knowledge the hard way. He's got something very few authors in this genre have: content validity. He can write with authority because he is an authority. Brian's approach to training is an intellectual one that requires patience, toughness, and commitment—the same qualities that make him the "pro's pro" on the platform, and the same system that has made him one of the most prodigious lifters in the history of powerlifting. The principles he'll show you in this book are the same ones he's paid for through years spent under the tutelage of the bar." 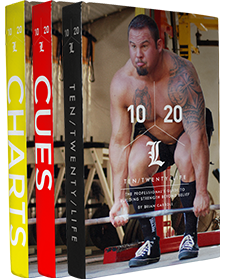 10/20/Life system, the Cues and Charts companions AND Brian’s Cutting Weight Manual! Obviously, not everyone has access to world-class coaching all the time. We can’t all train in facilities alongside a crew of great athletes, guided by coaches with decades of experience. That would be the ideal situation, but for most people, it simply isn’t going to happen. Life gets in the way of our “perfect world” scenarios, and nobody understands that better than I do. With 10/20/Life, my objective is to teach you to get the results you want by coaching yourself—the same way a superior coach would take you through an individualized program in a great gym. We start out with a thorough examination of your weak points, because that’s how quality coaching works. The idea is to show you what to program, and when, based on your weaknesses in the squat, bench press, and deadlift. This sounds simple, but it’s something most people don’t even consider, much less put into practice. 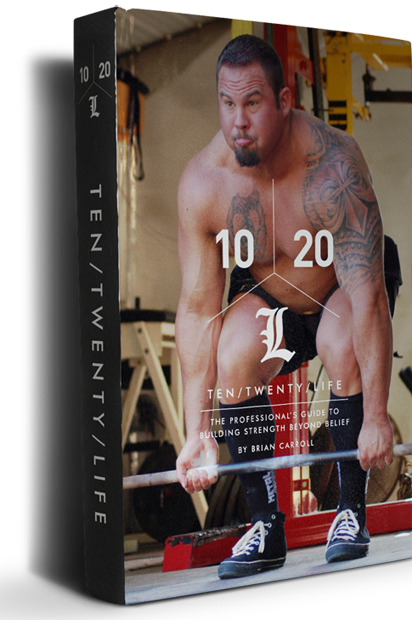 From there, the 10/20/Life system takes you through the best injury-preventative warm-up in the industry, followed by a comprehensive layout of coaching cues for each individual lift. From start to finish, you’ll learn what to look for and what to do, and you’ll learn the reasoning behind all of it. By the time you’re finished working your way through these materials, you’ll be able to coach yourself, and others, like a pro. It’s coaching—real coaching—and that’s the 10/20/Life difference. With 10/20/Life, you’re going to train either three or four days per week. On the four-day plan, you’re focusing on one big lift—squat, bench press, or deadlift—per day, along with a fourth day of strict assistance work. On the three-day “combo” plan, you’ll combine days. Determine your weak points in the main lifts. Use the Weak Point and Assistance Exercise indexes to custom design your own program. Follow the warm-up protocol listed. Determine your level of readiness, then train according to the system’s RPE plan for that day. Between all the weak “gurus” and unqualified CrossFit “coaches” out there, we have an entire industry filled with people telling you stuff that doesn’t work. Go on YouTube and watch some videos, and you’ll see exactly what I’m talking about. The whole internet is absolutely permeated with bad advice, stuff that’ll have you spinning your wheels for years, and hustlers who have no business talking about how to get stronger. I’m not a “fitness personality.” I don’t want anything to do with that crap. I want to make people stronger and get my information out there for people to learn the right way to train, but I’m not interested in becoming some kind of icon that everybody blindly follows. I think that’s weird, and I’m trying to do the exact opposite. Having a “bad@ss” attitude has nothing to do with results. I created 10/20/Life because I wanted to show people that getting stronger is what’s important in life—and not creating some kind of cool guy persona that everyone can try to be like. That’s not me. 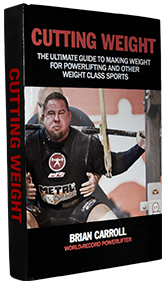 AND Brian’s Cutting Weight Manual! 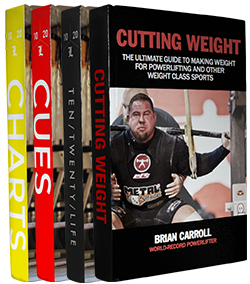 A competitive powerlifter since 1999, Brian Carroll is one of the most accomplished lifters in the history of the sport. After suffering a debilitating back injury in 2012—including several broken bones—Brian used his 10/20/Life principles, which incorporate the methods of world-renowned lower back specialist Dr. Stuart McGill, to return to competition with a 1080 pound squat at the 2014 Arnold Sports Festival. 2375 TOTAL (10th best of all time). 2570 TOTAL (5th best of all time). like a pro for life! a product you can use!